The Welsh Pony and the Welsh Cob get their names from the mountainous region of Wales from which they originate. Pre-dating the Romans, Welsh ponies could be found roaming the region, climbing mountains, leaping ravines, and running through rough terrain, resulting in the development of an extremely intelligent pony with remarkable soundness and tremendous endurance. Able to subsist on sparse vegetation and survive the severe winters, the ponies were prized by local farmers who began breeding them for use as sturdy work ponies. Welsh Ponies were first imported to the United States in the 1880s and their popularity has grown significantly over the years. Welsh Ponies and Cobs are well-known for their friendly personalities and even temperaments; they are extremely intelligent and easily trained. All Welsh types can be found in any color except pinto. Section A, otherwise known as the Welsh Mountain Pony, may not exceed 12.2 hands (50 inches) and should exhibit the classic, strong, sturdy conformation coupled with the stamina, endurance, and hardiness found in their ancestors. Section B is of a similar type to A but may stand up to a height of 14.2 hands. Section D, the Welsh Cob should possess as much substance as possible and typically have a moderate quantity of feathering on their lower limbs. The Cob should exceed 13.2 hands with no upper height limit. Today, Welsh Ponies and Cobs can be found competing in nearly every discipline, including hunters, pleasure driving, dressage, eventing, combined driving, heavy harness, and English and Western pleasure. Welsh Ponies and Cobs are ideal for the growing child, and have the spirit and endurance to challenge an adult; they are truly trusted companions that you will never outgrow. 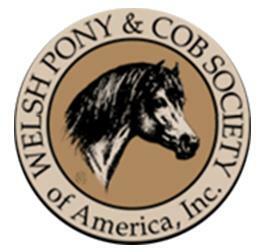 The Welsh Pony & Cob Society of America serves to maintain a registry for the recording of pedigrees and transfers of Welsh ponies and cobs, to promote the breeding and use of the breed, while striving to maintain its purity and trueness to type and to further its welfare in every way.